We’d love your help. Let us know what’s wrong with this preview of The Clockwork Menagerie by Elliot Cooper. Autosmith Clement Dyer wants to create his life-like, mechanical animals in peace. He's tired of being badgered about selling his business to his long-time rival and former lover, Duke Goodwin. He also craves appreciation for his living works of art. Unfortunately, not all of Clement's clients see his clockwork creations the way he does, and a prominent but dissatisfied cu Autosmith Clement Dyer wants to create his life-like, mechanical animals in peace. He's tired of being badgered about selling his business to his long-time rival and former lover, Duke Goodwin. He also craves appreciation for his living works of art. Unfortunately, not all of Clement's clients see his clockwork creations the way he does, and a prominent but dissatisfied customer threatens to sink his struggling business into the ground. To ask other readers questions about The Clockwork Menagerie, please sign up. First of all, I LOVED the world that Cooper created -- in terms of the automaton animals. I thought it was unique, and I imagined I would be very happy having one myself. A lovely pet with all the animal traits but no need to eat or defecate (haha). Perfect for a single woman who work outside of home for more than 12 hours like me! Unfortunately, I also thought it didn't reach its potential. The relationship between Clement and Duke happened off page, even before the first chapter. So I missed th First of all, I LOVED the world that Cooper created -- in terms of the automaton animals. I thought it was unique, and I imagined I would be very happy having one myself. A lovely pet with all the animal traits but no need to eat or defecate (haha). Perfect for a single woman who work outside of home for more than 12 hours like me! Unfortunately, I also thought it didn't reach its potential. The relationship between Clement and Duke happened off page, even before the first chapter. So I missed their connection or any emotional feel that could happen. Which is too bad because I love second-chances theme. Then after all the bad things that happened to Clement regarding his business, everything also solved rather quickly. So it was like everything was built up for some sort of climax but it never really happened. So I could only consider this as an 'okay' read. This sweet and fascinating short was a deight to read. It is the first thing I have read by the author and now I seriously need to squeeze more of him into my schedule! The author skillfully crammed a heck of a lot of story and characters into a small amount of space and left me seriously wanting so much more! Can't to get my hands on more of him! This story is bright with potential, unfortunately it's limited by the length. It's an easy read with some interesting features but I never quite felt there was enough there. Steampunk offers so many imaginative innovations and while the mechanical cat sounds absolutely darling (I've just had to oust my cat from the bath then deal with the 'spare cat' molt remaining) I'd have liked a better picture of the world. The society. Some more quirks. Side characters added flare in the glimpse we had of t This story is bright with potential, unfortunately it's limited by the length. It's an easy read with some interesting features but I never quite felt there was enough there. Steampunk offers so many imaginative innovations and while the mechanical cat sounds absolutely darling (I've just had to oust my cat from the bath then deal with the 'spare cat' molt remaining) I'd have liked a better picture of the world. The society. Some more quirks. Side characters added flare in the glimpse we had of them. The conflict happens years before the story begins, loosing all the emotional impact that would have offered. It kept things light, but with less meaning. Clement appears a sweet earnest (dare I say dim?) type, but we don't get to know Duke or see why the attraction. I felt the resolution came from nowhere, after years of suspicion it was a very sudden turn around with little to explain it. Then everything's neatly bundled up in a way that bothered me - too smooth, too mild a reaction, too much - but clearly from the other reviews it's just me who didn't like the reveal so feel free to ignore this review! It's a very simple, very short (finishes at 85% on my kindle) kinda sweet story. While I did enjoy reading it (and would be tempted by a longer book by this author) my rating is based on my overall feel - it left me disappointed, sulky-curmudgeon that I am instead of being charmed I'm afraid I was wishing a backbone -mechanical or otherwise- on Clement. Some sparks -mechanical or emotional- to make me care. I love, love, love a well written steampunk story, the language and visuals are so engaging and the subtle fantastical elements make for a fun escape. The Clockwork Menagerie delivered all of that in spades. The author managed to pack a lot of story and character development into 39 pages without the story becoming too “busy” which is where a lot of steampunk can go sideways for me. I like when less is more because quality words don’t need an excess of fluffy accessories. That’s why The Clockwor I love, love, love a well written steampunk story, the language and visuals are so engaging and the subtle fantastical elements make for a fun escape. The Clockwork Menagerie delivered all of that in spades. The author managed to pack a lot of story and character development into 39 pages without the story becoming too “busy” which is where a lot of steampunk can go sideways for me. I like when less is more because quality words don’t need an excess of fluffy accessories. That’s why The Clockwork Menagerie works in 39 pages. The characters are flawed, likable and charming all at once. I appreciated that very much because it gave an air of reality to a fantasy story making it that much easier to get wrapped up in Clement’s world quickly. The overall arc of disposable commodities vs. art and pride in workmanship is a really accessible theme that makes the crossover from fantasy to reality perfectly here. Reading about Clement’s creations was both fascinating and frustrating. All he wanted was to make his quality creations and support himself and his one employee. He has more ideals and ideas than business acumen and that’s where Duke comes in. Duke is swoonworthy from the beginning and while I should feel the animosity towards him along with Clement, I just couldn’t make it be a thing, I just liked him too much and knew there had to be more to him than Clement’s impressions. The end is the ultimate HEA for the Clement and Duke. It really couldn’t have been a better outcome. Sure, maybe a little toooo convenient and conflict free, but at that point I was too happy about what was happening to be picky. One of the most fun and entertaining Steampunk stories I have read recently, this is a charming tale about a man who wants nothing more than to design interesting little (or not so little) mechanical creatures. Business is tough due to demanding customers, multiple competitors are eager to put him out of business, and he never seems to be able to find enough time to come up with ”the next big thing”. Set in an alternate London of the nineteenth century, this is a world where aristocrats still ru One of the most fun and entertaining Steampunk stories I have read recently, this is a charming tale about a man who wants nothing more than to design interesting little (or not so little) mechanical creatures. Business is tough due to demanding customers, multiple competitors are eager to put him out of business, and he never seems to be able to find enough time to come up with ”the next big thing”. Set in an alternate London of the nineteenth century, this is a world where aristocrats still rule, the working class can thrive through hard work, and technology is focused on replacing pets and working animals with more “reliable” machine versions. Clement owns a shop and is a very talented autosmith – read designer and builder of intricate clockwork designs. Most of them are pets and sound utterly delightful based on the few I got to see as I read this story. Clement’s creations are all individually handmade and that is both his biggest advantage, because they are all unique and of high quality, and his biggest problem, since the materials are expensive and putting them together takes longer than using automated methods. He has his hands full with demanding customers, a competitor who wants to take over his business, and the fact that he is not selling enough of his machines to pay his expenses. I really felt for Clement. He is very creative and has some great ideas, but he is more of an artist than a businessman. It takes him a while to recognize and admit it, and when he does, it is almost too late. If it weren’t for his shop assistant and an unknown benefactor, Clement’s story would have ended very differently. If you like stories with charm and lots of fun little details, if you think a man who is dedicated to his work still deserves a loving partner, and if you’re looking for an entertaining read set in an alternate past, then you will probably like this short story. A character-driven short steampunk read, perfect for that quick bite of escapism. Elliot Cooper brings us Clement, a master craftsman who creates clockwork animals – he’s a bit reclusive and obsessed, certainly imaginative and carries a small chip on his shoulder about the difficulty he has in being recognized for his work. He’s truly a struggling artist, not as focused on the business end of his work as he should be. Duke is a former lover and a man well-heeled and capable of helping Clement su A character-driven short steampunk read, perfect for that quick bite of escapism. Elliot Cooper brings us Clement, a master craftsman who creates clockwork animals – he’s a bit reclusive and obsessed, certainly imaginative and carries a small chip on his shoulder about the difficulty he has in being recognized for his work. He’s truly a struggling artist, not as focused on the business end of his work as he should be. Duke is a former lover and a man well-heeled and capable of helping Clement succeed. What we don’t see is the initial sparks between them, or just how their relationship went south, but the sparks between them leave much unsaid yet felt. Duke is a bit heavy handed in his offers to help, he’s not perfect either…he’s relentless in appearing everywhere. He genuinely wants to help Clement – but these two are so different and driven in their own ways – it makes their conflicts and misunderstandings feel plausible. Secondary characters, particularly the animals that Clement creates are wonderful. The return of Ophelia the cat with her completely cat-like quirks and ability to be everywhere at once to distract was wonderful. Clement truly loves his little creations, and that imagination combined with the skill to build them, the clockwork elements and the decided perfectionism made me want to see more. Short yes – but none of the questions I had took me away from the story. I would have liked more of this world, and more of Clement’s work, but the creation of the world and making the relationship feel plausible while engaging my imagination as I tried to visualize it all stood solidly and make this a story well worth reading. >: Clement Dyer is a master craftsman, making his mechanical animals by hand, perfect and precise. The problem is it takes time to create the way he does and he’s really not business headed. He’s creative. Add in worry about competition from someone he’s slept with, and his latest problem with a returned pet is eating him up inside. The competition, in the form of Duke Goodwin, is practically stalking Clement. Trying to get a leg up on what he’s doing? Seems so. When that returned pet, a cat, >: Clement Dyer is a master craftsman, making his mechanical animals by hand, perfect and precise. The problem is it takes time to create the way he does and he’s really not business headed. He’s creative. Add in worry about competition from someone he’s slept with, and his latest problem with a returned pet is eating him up inside. The competition, in the form of Duke Goodwin, is practically stalking Clement. Trying to get a leg up on what he’s doing? Seems so. When that returned pet, a cat, is set to cause havoc and perhaps the end of Clement’s business, the last thing he needs is Duke butting in yet again about a merger. Duke comes across as arrogant at times, which makes the story work even better. This is a character driven story and I loved the world where Clement and Duke live. I loved the idea of the Menagerie. I’d love to see one, see Clement create. I would have appreciated more of this, to get a better understanding of Duke particularly. A great thing here is that neither Duke nor Clement is a perfect MC. Both have flaws and the misunderstandings are realistic. The actions of their earlier night together make sense when the reasons are disclosed and that was adorable. Could this have been longer? Of course. Did I feel anything was missing? Absolutely not. I had questions but there was nothing that detracted from the story. For a steampunk fan or lovers of light, sweet romance, this is a keeper. This is my first book by this author and I’ll definitely be looking for more. I absolutely adored everything about The Clockwork Menagerie. Once the cover was revealed it immediately went on my TBR. I even told Elliot Cooper that the story better live up to the very imaginiative cover. It really, truly did. Surpassed in my opinion. The Clockwork Menagerie is a story about a gentleman named Clement who creates and builds animal automatons. They are realistic in their looks and mannerisms. Ms. Ophelia the cat was a splendid little character who brought much needed comedic r I absolutely adored everything about The Clockwork Menagerie. Once the cover was revealed it immediately went on my TBR. I even told Elliot Cooper that the story better live up to the very imaginiative cover. It really, truly did. Surpassed in my opinion. The Clockwork Menagerie is a story about a gentleman named Clement who creates and builds animal automatons. They are realistic in their looks and mannerisms. Ms. Ophelia the cat was a splendid little character who brought much needed comedic respite for our Clement I couldn't help but fall in love with her. Clements store isn't doing so well as his mind isn't one for business but creativity. One of his rivals and ex-lover, Duke Goodwin, has attempted to help but it seems even his pedigree wouldn't impress on Clement. Especially after a general misunderstanding that left Clement with a hardened spirit. The Clockwork Menagerie has a steampunk vibe throughout the story. I certainly savored the freshness to this story. Elliot Cooper did a most magnficant job in constructing The Clockwork Menagerie atmosphere. The scenes were orchestrated without any flaws that I could detect. I was captivated for every sentence. I want more. I want to know what happens next and I want details!!! Oh what a lovely and great short story! This was surprisingly good and I can’t wait to read more books by the author. In only 38 pages Elliot Cooper manages to create a complex and interesting steampunk setting and Clement, our protagonist, whom we quickly care for. He is a well fleshed-out character with some endearing character treats. But we do not only get one great character; even the secondary and minor ones stand out and come alive on the page. A huge focus of the story is on Clement’s work Oh what a lovely and great short story! This was surprisingly good and I can’t wait to read more books by the author. A huge focus of the story is on Clement’s work of traditionally creating clockwork animals and I found this to be very interesting and charming. Come to think of it, even the automaton cat Ophelia is a living entity on page who gives the story more depth and character. Woven into this is a very sweet and romantic love story. Although we don’t see that much of Clement and Duke together, it’s as if we know them quite well and can’t but root for them. I really liked their scenes together and I love that they are so honest and open with each other in the end. This review has been hidden because it contains spoilers. To view it, click here. OMG. I love this story very much. There's a lot to love about The Clockwork Menagerie. For one, while short and sweet, the world that the author created is vivid in my head: historical and yet modern because of the advanced technology used to make mechanical animals which I find unique and beautiful. The main character Clement Dyers is one of those who eked out a living by making life-like mechanical animals. Unfortunately he is dealing with many issues all at once: business problems, his former OMG. I love this story very much. The main character Clement Dyers is one of those who eked out a living by making life-like mechanical animals. Unfortunately he is dealing with many issues all at once: business problems, his former lover, and his stark future. Secondly, every character and scene in this story has a purpose and as with the setting, the three main characters are well-written. Lastly, the love interest Duke Goodwin made me feel "kilig." Nothing like a persistent guy trying to say sorry and make it up to Clement in his own special way to sweep not only Clement off his feet but also its readers. 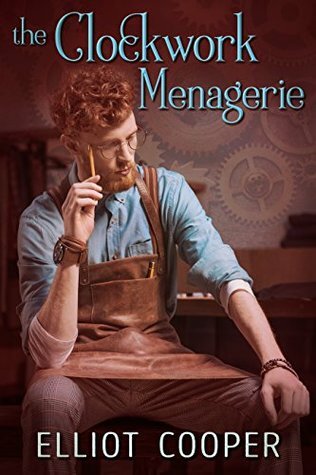 Five stars to The Clockwork Menagerie by Elliot Cooper. Here's to hoping we read more of them and more of this universe. Thank you to NineStar Press for giving me a free copy in exchange for an honest review. I'm a fan of the Steampunk genre and automatons, having said that I found this story sweet, more than interesting and very creative but definitely too short to be completely satisfying, at least for me! I received a free copy of this book in exchange for my review. Steampunk is one of my favourite genres and I am always on the look-out for new stories and new authors. The Clockwork Menagerie is both of those for me and I was excited to read it. I did wonder how much world-building and story development could be included in only 39 pages but the answer turned out to be quite a surprising amount actually. I felt sympathy for Clement right from the first page. He is a man with morals and ideals whi I received a free copy of this book in exchange for my review. I felt sympathy for Clement right from the first page. He is a man with morals and ideals which don’t necessarily fit with the world he finds himself in. He dreams of creating animal automatons which are intricate and life-like but, unfortunately, there’s no market for them. Duke is also likeable right from the start. I was probably biased towards him from the point where we learn he has a (ridiculously well-groomed, gracefully curled) handlebar moustache! He and Clement have history together and due to a misunderstanding Clement maintains that he no longer wants anything to do with Duke. Business is slow for Clement so he has plenty of time to work on his new designs and he would be able to get on with this in peace if it wasn’t for Duke turning up all the time. It was fascinating to read about all of Clement’s creations. One of my favourite things about steampunk is the automatons. I love the idea of being able to create life-like creatures from mechanical things. The way that Clement treated his creations like real pets also endeared him to me. If I have any complaint, it’s that we didn’t get to meet more of his magical creations. I felt at home in this steampunk world straight away and I am hoping that there may be more stories to follow. Wonderful read, although too short! I was a bit worried that I wouldn't like this book because I'm not into steampunk, but once I got to reading, I absolutely fell in love with Clement. Not to mention that I loved the tension between him and Duke, and I thought that what Duke did for Clement was really sweet. I wouldn't mind having such a menagerie, myself. I was also impressed that the author managed convey such a fascinating s I received a free copy of this book in exchange for an honest review. I was also impressed that the author managed convey such a fascinating story in 39 pages. I've read my fair share of short stories, and it's a bit hit and miss, but this book's plot and characters were well written. I received a free copy of The Clockwork Menagerie in order to prepare for an interview with the author. You can read the interview here, and I hope you do--I get into a lot of what I enjoyed about the story with Elliot, and I really, really enjoyed the story. The Clockwork Menagerie was lovely from start to finish. It felt like a warm cup of tea, the perfect antidote to a bad day. The characters were charming, and I was genuinely caught up in their story almost immediately. The conflict felt nat I received a free copy of The Clockwork Menagerie in order to prepare for an interview with the author. You can read the interview here, and I hope you do--I get into a lot of what I enjoyed about the story with Elliot, and I really, really enjoyed the story. I've never read a steampunk novel before, so I was surprised at how much I enjoyed the Victorian world with automated animals and wanted to know more about it. But I most enjoyed the main character with unexpectedly relatable life, problems, and flaws. I found myself feeling his stresses and his joys. Very worthwhile read and sweet feel-good story. Totally disarming and sweet story set in a world I'd like to visit again. Enjoyed this so much, can't wait to read more by this author. The ending was a little quick and it was disconcertingly chaste (mostly b/c I've read very steamy stuff by him), but overall I really enjoyed this. Well balanced for a short story. I would love to see longer works in this world, and I'll read more by this author. This was a beautifully imagined and perfectly written novella. The characters were rich and multi-dimensional and I fell in love with the main character's creations. I enjoyed this immensely! I loved this book so much. It was a little unexpected to me, because it’s not what I would usually read, but I give it a try, and glad I did because it was great. Clement is an autosmith, he’s good creating mechanical animals but his business is facing bad times. He needs to deal, not only with that, but also with the mischievous behavior of his rival Duke. The world created by the author was so beautiful. A perfect mixed between the technologies used to build of the animals and the, sort of histo I loved this book so much. It was a little unexpected to me, because it’s not what I would usually read, but I give it a try, and glad I did because it was great. The world created by the author was so beautiful. A perfect mixed between the technologies used to build of the animals and the, sort of historical, moment of time they live into. The pace was steady, with a few moments when it speed up a little. It took my attention the whole time. The character were my favorite part of it. There was no one person who appeared on the book, that I wasn’t interested in. Even the ones who were there for little time or the ones who seemed unpleasant, all generate some kind of emotion to the reader, and that was simply amazing. I really liked Clement, the way he believed in his creations. His feelings were so easily transmitted to the reader, I liked that a lot. Duke was a little bit of a mystery, but I feel like that worked better for the story, the interactions between him and Clement were so great, but I felt liked there were too few. The only problem I had with it was that it was too short. I wanted to know more about the story. I truly hope there’s more of this, I would love to know what might happened from the point the book ends. *I received a copy of this book from the publisher, in exchange of an honest review. This is a lovely short work, with very appealing characters and a clever steampunk-flavored plot. Clement is an autosmith, a maker of mechanical creatures; he runs his own business, even though his real talent is in making artistic creations. There are a lot of details about how he makes his automatons. As with Elliot Cooper's book Junk Mage, the setting is not incidental. Everything in this story flows from who Clement is, as well as his goals and skills, and he and his profession really come a This is a lovely short work, with very appealing characters and a clever steampunk-flavored plot. Clement is an autosmith, a maker of mechanical creatures; he runs his own business, even though his real talent is in making artistic creations. There are a lot of details about how he makes his automatons. As with Elliot Cooper's book Junk Mage, the setting is not incidental. Everything in this story flows from who Clement is, as well as his goals and skills, and he and his profession really come alive. Clement's business is seriously struggling. He doesn't want his business to fail, and he also doesn't want to let down his assistant, Elsa, who has become his best friend. I couldn't predict how the romance between Clement and his business rival would happen here, and I wouldn't have guessed the ending, either. It was very sweet, in a quiet sort of way, and was a satisfying conclusion to the story. I thought the length was perfect, allowing the whole story to be told, with an intriguing plot and a good amount of character development for Elsa and Clement. Clement's love interest, Duke, is less developed, but certainly well-drawn enough. Duke also has a handlebar mustache, which is pretty great! The plot works so well because Clement is easy to cheer for, with all his stubborn pride and dedication to his work. The writing style is very clear; descriptions are somewhat detailed, but nothing ever feels unnecessary. And the mechanical creatures were adorable! This was an intriguing steam punk short story. The world building was vivid. The characters well well fleshed out and extremely likable. A compelling love story. I enjoyed this. I was a little sad when it was over. I’d love to read more from this couple or world in the future. Clement likes to work alone while building his mechanical animals. He’s resisted offers to merge with the larger shops that mass manufacture because he takes pride his work and his craftsmanship. He hand makes every piece with care. He’s also struggling to keep the shop afloat. He’s not great at the business side of things but he loves to create. His biggest rival in town is also the love interest in this story. Clement just questions whether or not his interest in him is business or personal. This was a very intriguing story. I've never read something set in what seems to be a steampunk setting. I also liked the idea of lifelike animals made of metal and gears. It was well crafted, well edited and the characterizations were very good, especially for a rather short story. That's quite difficult to pull off. Even the secondary characters had a good framework. The relationship aspect was also conveyed well, when the interaction of Clement and Duke was confined to the latter pages. I'd b This was a very intriguing story. I've never read something set in what seems to be a steampunk setting. I also liked the idea of lifelike animals made of metal and gears. It was well crafted, well edited and the characterizations were very good, especially for a rather short story. That's quite difficult to pull off. Even the secondary characters had a good framework. The relationship aspect was also conveyed well, when the interaction of Clement and Duke was confined to the latter pages. I'd be interested in a longer work by this author, especially written in the same world. 3.5 stars. I really enjoyed this. It's a gentle and lighthearted romance novella about a charming craftsman with a struggling business who finds love. Clement designs and builds life-like mechanical animals and, while he is a brilliant artist and engineer, he's not a very good businessperson. I enjoyed all the detail and the secondary characters are wonderful, as are the animals themselves. This is a lovely little steampunk story that's nicely written and a little bit delightful. This is a quick read but a feel good story. There's a misunderstanding that occurred before the story started and it's caused more misunderstandings. However, they do communicate in the end. I would have liked to see more of Clement and Duke. Since so much of what occurred between them happened before this story started, it made their relationship seem a little rushed. However, it was sweet and I really want a mechanical cat now. I have a new love in my reading and that is Steampunk. I really enjoyed this one, wished it could have been longer, or that there will be more from this authors world.